Let’s call it what it was: Africa’s performance in Brazil was a debacle. 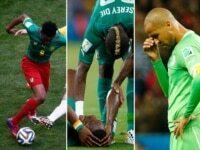 It took me some time to get over my emotions and stop looking for evidence where none is needed: Five teams, two in the second round, a total of 32 goals conceded, including nine for Cameroon . This is not to point fingers or rub salt in the wounds but rather to better understand what other teams are doing that Africa clearly is not. Compare African teams to those Western teams that have had success in this World Cup. In terms of successful shots and success in the box the Western teams out-maneuvered us. Take Holland as an example. Statistically it is the most successful team in terms of conversion of shots made in the box into goals. Despite its success, the Dutch had a lower success rate than Algeria, which counted an average of nine shots per match. Here, the statistics speak for themselves. But I just want to add the fact that there is a lack of finishing. One thing that the percentage of success has shown is that Africa has the know-how, but lacks discipline and creativity especially in attack, which prevents it from capitalizing on opportunities. Overall, the ball is part of a set of criteria to understand the health and tenacity of a team. Consider passing, assists, shots on target and total possession during the game. The team with the highest percentage of possession per game is Argentina with 65 percent on average. By comparison, only Cote d’Ivoire manages to rise above 50 percent. We have the numbers. So what must we remember? Two things. First, African teams have more talent than the Western teams. You can see that in the numbers. Second, African teams have a chronic, and I mean chronic, shortage of creativity in the execution of their game plans. Simply stated, there is a lack of finish. Teams manage to create opportunities, but not to score. They parry attacks, but the rebound does not follow. When we look more closely at the ratio between the number of assists and the missed shots on the one hand, the goals of each other, we realize that this is a correlation that does not exist in Africa . African players do not pass in the penalty area. However, the other teams are doing this. France, for example, scored 68 percent of their goals with a decisive pass in the penalty area. The numbers tell us, we must listen. ← World Cup Quarterfinal: Who Will Advance?